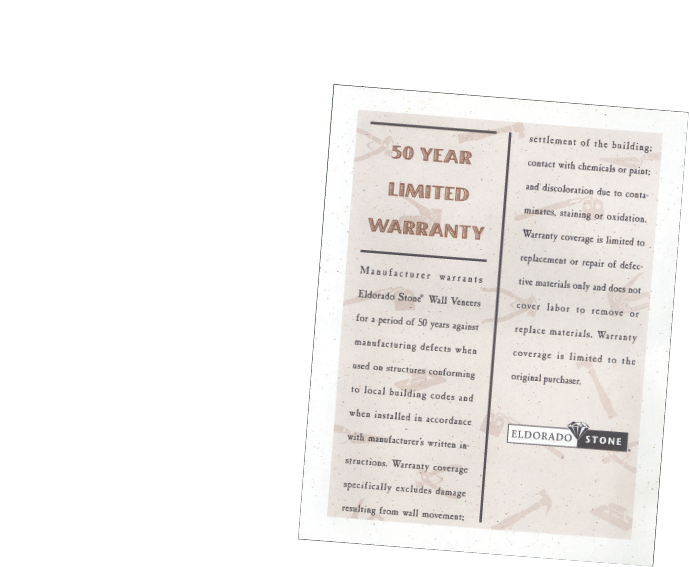 The warranty is limited to the original purchaser and cannot be transferred to a second owner. The supplier shall replace any parts found to be defective, free of charge. The warranty only covers manufacturing defects of the product. It does not cover labour to remove or install the defective material. If the user fails to comply with all the conditions set out in the Installation Manual that is attached to each delivery (or can be downloaded from the Installation manual page) and does not use the GEOCOLL and GEOBI systems recommended by Geopietra, the warranty will become null and void and the seller shall not be held liable for any problems arising therefrom. Colour fastness to sunlight Only permanent pigments containing mineral oxides are used. The colour sets after 2-6 months of exposure to weather. No unwanted change of colour have been observed, even after years of exposure.